Today is a pretty tremendous day in the life of our family. This evening, I’ll be baptizing my older daughter, Mary. She started thinking about what it means to follow Jesus when she was five, and when she was six, she decided to follow Jesus. However, six is awfully young to make such a momentous decision, so her father and I have instructed her through a three-year catechism period. We’ve used this time to teach Mary what it really means to follow Jesus. The last Sunday in April, she decided (with our blessing) that she was ready. She had two requests: One, that she be baptized at the beach (part of the joys of living at the coast), and two, that I baptize her. I’m honored. And a little nervous. 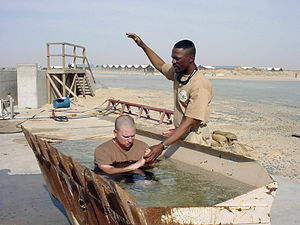 Baptizing in an ocean isn’t as easy as baptizing in a still pool. And it’s my first real baptism, though we practiced at the beach last week. But it’s my daughter, and that’s the important part. She woke up happy and excited. Mary’s written and rewritten her faith story until it’s just the way she wants it. She’s drawn in our studies of the Bible and referenced in some way all the people who have influenced her faith journey, some by name. There are so many more who she doesn’t even realize, but those were the top ones. My heart is joyful when I remember all those saints who have loved and nurtured her through her life and journey so far. My prayer is that each and every one feels a heaping dose of God‘s blessings today. The Didache says that baptisms are to be done “by immersion, in living water,” and the water should be cold. Well, 76 degrees isn’t exactly warm, that’s for sure! We’re Baptist, so we baptize by immersion, anyway, and “living water” is a way of saying “moving water,” like in a stream or river or, well, an ocean. I’ve moved past my anger, sadness and disappointment over those who have chosen not to be there for this momentous event in Mary’s young life. They made their choices long ago about the roles they wanted to play in her life, and, frankly, I think it bothers us as her parents more than it bothers her. It’s a good lesson for us about brushing that dust off our feet. My dad’s coming. He’s a minister, doing some pulpit supply preaching and motorcycle evangelism. He might cry; he’s a strong man, but not afraid of showing emotion. He’s a man immersed in the experience of strong-willed females, but he adores us all. My youngest has asked me this week if I’ll baptize her when she’s ready (she’ll be 4 this Summer). I told her I would. She told her Dad that she wants him or her Grandpa to “ride her” to the beach on his motorcycle when it’s time for her baptism. It’ll have to be her Grandpa; her Daddy doesn’t ride. It’s ridiculous to think about this, but I had the moments of wondering what I’d wear over my bathing suit. A white minister’s robe is traditional, but not in the ocean; that’s just dangerous. I’d already decided on white shirt and beige shorts – traditional and practical. But then I thought about one of my Div School t-shirts, the one that says, “This is a high and holy day.” And it is. I’m still going for the white, but that doesn’t change the fact that this is, indeed, a high and holy day. This entry was posted in Faith, Parenting and tagged Baptism, Baptist, Bible, Didache, God, Holy Spirit, Jesus, Mary. Bookmark the permalink. I am there in spirit. Please tell Mary I am proud of her. Brought tears to my heart…tears of joy. Grace and peace be unto you and your family. God is great.